Thumbing through my guidebook for a hotel in central Maputo, the first thing that hit me was the street names. Portuguese colonial city is named after some horrible Marxist dictator. Some were kind of kitchy -- I could handle staying on Avienda Salvador Allende, but the corner of Vladimir Lenin and Mao Tse Tung? That made me a bit uncomfortable. There were many other discomforts in this city. Start with the horrible stench of huge garbage piles that dot the crumbling sidewalks, and the amazing lack of air conditioning even in expensive hotels and restaurants. This made me wonder if I was the only person who realized it was 90 degrees and humid. It doesn't seem fair to be hard on Mozambique, given its troubled past. One of the poorest countries in both Africa and the world, Mozambique has only recently begun to recover from 20 years of warfare egged on by anti-colonialism, cold war politics, South African apartheid, and tribal differences. Portugal suddenly cut the colony loose in 1975, and an oddball group of Marxist revolutionaries seized power while the educated elite fled the country en masse. The ruling party has since renounced its Marxist ways, but it left the country so bankrupt that renaming the capital's streets again is a luxury Mozambique can't afford. A quick stroll through town reveals what a gem this city once must have been. Crumbling Mediterranean villas line the streets, occupied by people who can afford satellite dishes and expensive cars, but apparently can't spring for a housepainter or even the most rudimentary lawn care. This combination of wealth and decay was everywhere. It would have been perplexing had I not met Roi, a former resident of the city when it was known by the Portuguese name of Laurenco Marques. Chatting at a café in Pretoria the evening before my arrival, Roi said he owned two houses in Maputo, both of which were occupied by squatters after the revolution. Not having titles to the houses, he explained, they are too afraid of losing them to invest in any maintenance. As a result, they slowly fall apart. Some of the homes are now burned out shells, with caved in roofs. The sidewalks in front of all the buildings are cracked and ripped to dust by the constant twisting of the beautiful flame trees that still line the broad streets of the city. In some spots, remnants of black and white Portuguese tile work retain enough beauty that it makes your stomach sick at the fate that has befallen this town. Touring Maputo makes me wonder if this is what it was like to visit the Forum shortly after the fall of Rome. But all is not lost in Maputo. The city enjoys a vibrant population of beautiful people who speak Portuguese with a charming African lilt. In many places, new hotels and restaurants have risen from the ashes to cater to the foreign businessmen that can be seen all over town. We stayed in one of these hotels, the Pensao Martins, set in a professionally remodeled old building with a lovely garden and pool in back. This garden oasis was just the refuge needed when the sights and smells of Maputo became overwhelming. After checking in, we went to the better-maintained east side of town for dinner. Maputo has an abundance of sidewalk cafes and Avienda Julius Nyerre was the best place to find them. Once the sun set, the city's blemishes were less noticeable, and the warm Indian Ocean breeze rustled the leaves over the beautiful tree-lined street to create a very relaxing environment. Given its poverty, Maputo is a surprisingly relaxed place. People rarely ask foreigners for money, and con men are seldom to be found. While other cities in the region -- especially in South Africa -- foster a pervasive air of tension derived from terrible crime problems, Maputo comes to life in the evening, with a diverse mix of residents and foreigners strolling the sidewalks well into the early morning hours. We enjoyed this environment from our sidewalk table, where I had the national dish of Pri Pri Chicken -- a grilled half bird marinated in a Mozambiquan spice blend. The hours quickly slipped away as we sipped locally-made Laurentina beers, watching the city go by. 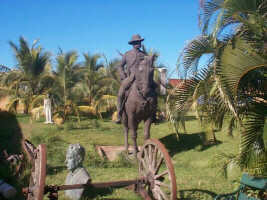 Maputo was to be an overnight stop before travelling to the Mozambiquan beach resort of Xai Xai. Since we slept too late for the morning bus, we figured we'd tour the city before taking a late afternoon departure. 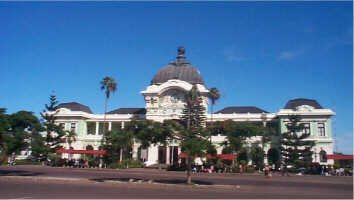 The historic city lies in the southern part of town about a mile from the modern business district. We walked down past the main cathedral, a distinctive mid-20th century building looking a bit like the fictitious castle in Oz, but with broken stained glass windows marring its otherwise beautiful façade. Across the street were the botanical gardens with a metal house designed by Eiffel (of Eiffel Tower fame) standing at the entrance. The gardens were clearly once grand. Today, the iron fence has collapsed in places and old tires fill the circular cuts in the walk meant for trees. The still-blooming flower beds are strewn with garbage, and the park benches are collapsing or completely disintegrated. Only the garden's beautiful trees -- like the others all over town -- remain in good condition. A few blocks further we came to a large plaza facing the historic fort. The plaza had a craft market where dozens of artists sold woodcarvings and tapestries. The Portuguese tile work on the park's paths was fantastic, but caked in mud. The grass was strewn with garbage, and boys collected water in old coke bottles from a tap in the lawn. The mid-nineteenth century fort was tiny but perfectly restored. This was shocking given the advanced state of disrepair of everything in the vicinity. We walked through an opening in its old stone walls to find an incredible artistic garden featuring statues of Portuguese colonial heroes that had apparently been removed from other parts of the city. The ramparts had a few small cannon on replica wooden stands. The garden in the middle had beautiful flowering plants, and a set of cast bas relief murals showing the conquest of Mozambique by the Portuguese. Walking west from the fort, we passed beautiful 18th and 19th century buildings falling to dust, some with squatters camped in the windowless frames. After several blocks of this, it was a surprise to see the beautiful Eiffel-designed train station in full grandeur. It had a working fountain out front and well-maintained flowering trees and shrubs. We toured the less-grand interior before heading back to check out of our hotel. With tourism infrastructure still limited in Mozambique, the only way to get to Xai Xai beach without a personal car is to take a long distance bus. For this, we had to take a taxi out to the Oliveras bus terminal on the west side of town. Having traveled extensively by public bus in Asia and Latin America, I figured I was well prepared to do the same in Mozambique. I was shocked by what I found. The bus terminal entrance was down an alley in a gritty industrial neighborhood. Once in the door, the environment changed dramatically and instantaneously. Gone was the dumpy neighborhood with loitering drunks and shanties. Now we entered a festering room of Mozambiquan peasants wearing little more than rags -- lying on the filthy cement floor or standing by the hundreds waiting for busses while watching their meager possessions. The hanger was filled with old busses, many packed two or three deep, along with bus parts like transmissions, tires and axles leaned up against the cinderblock walls. An anarchic line led up to a ticket window in a wall recession. I had to work hard to get up in line -- people pushed in from all sides. Near the front, I could see the ticket agent was behind a set of metal caging and class that was so papered over with old postbills that only a tiny opening remained clear. I had to duck down to talk through the opening to get my tickets. The tickets were on some kind of ancient grainy paper that looked straight out of the Glorious Soviet Printing Plant No. 732. With them in hand, I made my way back from the line, nearly getting sick at the sight of a little girl, maybe six, who laid on the ground with flies all over her feet just inches from a fly-covered piece of rotting fruit. I walked around to find our bus, and was eventually directed onto a vehicle that was run down and dirty, but looked workable. It was hot outside, and even hotter under the metal roof of the station -- hotter still inside the metal box of the bus. It was 12:30. Our bus would leave at 1:00, the conductor said. As time went on, the bus became more crowded, and it grew hotter. I was perspiring profusely in the stagnant humid air, and even the acclimated locals appeared quite uncomfortable. The aisle eventually was completely full of people, many of them holding their possessions overhead. I could barely breathe by the time a young woman leaned over to get extra room for the giant terracotta pot she held over our heads. With all the bodies, the temperature rose further, and I had rivers of perspiration rolling down my face. We began to discuss getting off the bus. I knew it would get cooler when we departed, but there were now so many people on board that the chance of getting air flow was limited. I was worried I would pass out any moment. We had to abandon the bus! I never quite recovered from the bus station, and we departed the country the next day. It wasn't until I developed the pictures from the trip that I could truly appreciate the city's stunning beauty that persevered in spite of everything working against it. 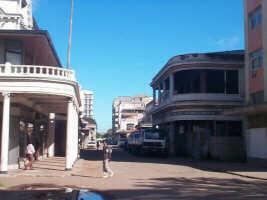 Maputo is a fascinating place where a new town is arising from the beautiful ruins of the colonial city. Its beautiful people, relaxed atmosphere, and history of warped politics make Maputo the most surreal city on the African continent. 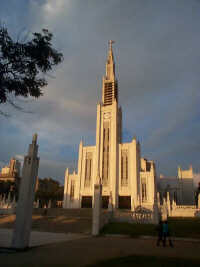 David G. Young and Lee Ann West visited Maputo for three days during a Round-the-World trip in March 2001. Read a Travel Log excerpt from Maputo.